I will shot someone if they don’t change the super misleading title. Daylight Entertainment has the best trailers. They can build up suspense even where the actual series fails. 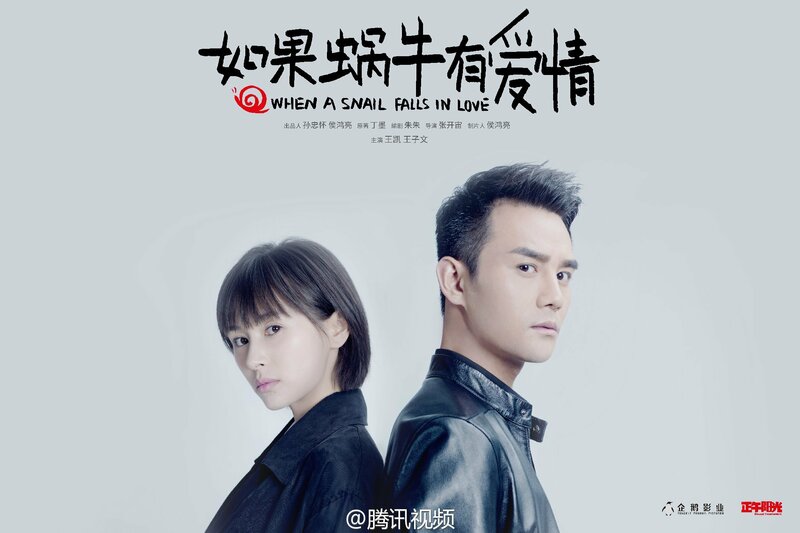 Their latest work is detective series When a Snail Falls in Love 如果蜗牛有爱情 starring Wang Kai and Wang Ziwen in their third drama together. The trailer looks great as usual, with movie-leveled cinematography, actually decent action sequences, and some moments of cuteness injected in the midst of suspense. The series is based on the book of the same name by author Ding Mo and directed by Zhang Kaizhou (two of the three people behind the spectacular fail of Love Me If You Dare). Luckily, the scriptwriter is not Hai Yan, who can’t write for the screen to save her life. If anything, it’s only 15 episodes, which hopefully means it’s faster-paced. I love how Zhang Kaizhou actually plays with the shots. And now that he has a drone camera, there are even more exciting shots like the last scene. Unfortunately he still has a lot to prove after Love Me if You Dare , so we’ll see. Meanwhile, I’m still waiting for the entire script department of Daylight Entertainment to step up their game and stop writing 30-minute scenes of awkward dinner dates. This entry was posted in Drama, Mainland China and tagged Daylight Entertainment, Ding Mo, Wang Kai, Wang Ziwen, Zhang Kaizhou, Zhu Zhu by idarklight. Bookmark the permalink. my 2 cents: LMIYD isn’t that bad overall. It’s still better than the average C-drama. I just thought the last part where they make Terence Yin as the main villain was the worst. It would be better if they don’t make Bo Jinyan sound like an idol guy after a few episodes. Having the greatest number of viewers isn’t always a good indicator of how great a series is. There are a lot more singers listening to pop than Beethoven. It doesn’t mean pop is best. A typical Walmart t-shirt is more widely owned than a designer shirt. Who is to say the Walmart shirt is best? Every viewer has different likes and dislikes. I thought both LMIYD and Ode to Joy are both ok. Not great. The problem I have with OtJ is the topic of nasty relatives is rather mundane and commonplace. It doesn’t make for an interesting story. I’m referring to Jiang Xin’s Fan Jie subplot. It takes quite a few episodes to resolve. The omnipresent OtJ narrator is a weird choice too. Oops. Sorry. Typed some wrong words and had some typos above. I meant “listeners”, not “singers”. There are others. Your low opinion of Hai Yan’s scriptwriting runs counter to the very high acclaim by Taiwanese literary groups and viewers in general. Didn’t Hai Yan wrote the screenplay for Nirvana in Fire as well? Not just the novel, and the production team confirmed that she did the script mostly by herself. I would say the script for Nirvana in Fire is really good, especially considering it is her first serious attempt at it. I don’t think she’s a poor writer, just a lazy scriptwriter. Her scriptwriting method is just taking the book and putting the scenes to script without modifications. There’s no value-added. Personally, i don’t like script writing that deciate from the source material too much. Feels like if they have want to write their own stories, just develop their IP, more often than not the added scenes are just cliche fillers that tends to drag on and on anyways. It depends on the source material. NIF was good enough that most scriptwriters would ruin it by trying to change too much. I think Ode to Joy changed a bit too much. Both Battle of Changsha and The Disguiser had a mediocre original and they completely changed characterization and plot for the better. LMIYD needed the same level of overhaul, but it didn’t get it. NIF also had the benefit of being set in ancient times, so people didn’t mind that the characters spoke differently. The dialogue in LMIYD is equivalent to if everyone in Sherlock says “you gave me a fright” instead of “you scared me” all the time. It’s just weird and ooc. Love Me if You Dare was generally panned for a slow and awkward script, poor characterization, lack of chemistry, and no sense of pace. It’s viewership ratings fell from like 0.7 to 0.3 during airing. Most good shows see increases in viewership. For example, Ode to Joy started with 0.6’s and hit about 1.7 for each of the two channels for a total of 3.4. Even producer Hou Hongliang said at this press conference they’re hoping to use this to make up their regrets from Love Me if You Dare, so …. Well we can’t talk about good characterization and development of themes in Cdrama world as most of them are superficial. Also, achieving high rating does not mean that a drama is good. Most of the succesful dramas are really poor and cheap. take the example of the Palace 2011.There are exceptions of course. LMIYD is definitely not the best Huo HongLiang’s name has been tied to, not by a long shot, but I doubt he said that about LMIYD. The ratings did quite well even against Legend of Miyue, which had all the elements to win the viewership in China. It reached a celebratory viewership count on online sites as well. They even discussed about making a sequel. I don’t think they would even bother with the possibility of a sequel if they really did regret the first installment. I don’t agree that it was a failure. Dramas can succeed in different ways, more so in one way than the other. Take Battle of Changsha for example. Beautiful drama overall. Good script. Superb acting and production. Rating wasn’t good and it generated very little buzz. Not many people have seen it. But anyone who has, knows it was a good drama. So was it a failure or not? LMIYD is actually one of the most successful Cdramas in recent years, internationally; garnering tons of fans who has never seen a Cdrama before. Check the numbers of tags on IG and the ratings, comments, and viewership on international video sites. They are phenomenal. Btw I wished you hadn’t compare LMIYD to Ode to Joy, as the good drama. Ode to Joy, IMO was a failure. Everything you wrote said that made LMIYD a failure – a slow and awkward script, poor characterization, lack of chemistry, and no sense of pace, can also be said of Ode to Joy. Biggest ShanDong disappointment to date. At least LMIYD was entertaining. Like belkissmisa92 said, there are various ways to measure success. I didn’t like neither Ode to Joy nor Miyue, but Ode to Joy and Miyue’s viewership and online streaming are ten to twenty times that of LMIYD. Battle of Changsha actually broke 1 in viewership by the finale, which is considered decent. Changsha’s also deservedly well reviewed, whereas LMIYD did not have very good reviews, especially compared to some of the other Daylight dramas and to most of Wallace Huo’s recent dramas. Although, I guess if you count International success, that’s one potential measure. As for Hou, he said yesterday that he is more involved in this drama and hopes to redeem himself following LMIYD. He’s also said in a previous interview that LMIYD was a test-run and they tried too much to film what they thought netizens liked and won’t do it again. P.S. Most of the pairings within the five leads in Ode to Joy totally had chemistry at one point or another. But I do agree with all your other comments on Ode to Joy. i think, LMIYD is internationally popular bcuz of Wallace Huo. i followed that drama and read the novel, but yeah… after reading the novel, i have to say that the drama was slightly disappointing. i got bored in the last episodes. i don’t know. but… even with slow rhythm.. i could bear watching OTJ. lols.. i always like dramas with high rating. not only Cdramas, but also Kdramas and Jdoramas. it won’t be fair enough to compare OTJ and LMIYD in storyline. but for rating, omo.. i didnt know that LMIYD got so low. im waiting for this Wang Wang couple new drama. my only problem is their ‘style’. we need some change here and there especially hair style. I actually really like Wang Kai’s outfits here. Simple, smart, but not avant garde. They fit his character and him. I like Yang Rong’s outfits in the Yu Zheng equivalent better, so I think Wang Ziwen’s outfits could be improved. Ok LMIYD I could not for the life of me finish despite Wallace Huo and Wang Kai being in it AND reading the book beforehand. The book was quite interesting and the actors in the drama (minus Sandra Ma) were good, but there was absolutely zero chemistry and the pacing was soooo slow. It was good internationally because of Wallace Huo and being Eng subbed on Viki. Ode to Joy I haven’t finished watching yet because of time constraints but I liked it from the first half that I saw and there was chemistry between the girls (not between any of the pairs though). The cast was good and the storyline was more down to earth realistic than most modern dramas.